Last night we stayed at a Holiday Inn Express which offers a continental breakfast. My 9 year old daughter was fascinated with the automatic pancake maker. 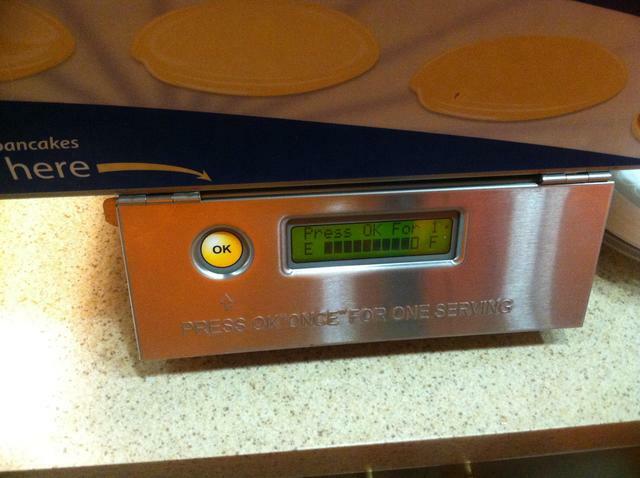 Simple as can be, press OK and less than a minute later a pancake pops out. I was curious. What if I wanted more than one? As the maker worked its magic, I noticed it said Making pancake 01 of 01. Ok, so it must be possible. Examining the front of the device made it apparent that the aluminum was covering up something. After I waited for the Holiday Inn Express employee to leave, I pulled on the cover, revealing a control panel with a number pad. I hit 3 and OK and the pancake maker came to life, working on pancake 01 of 03. Very cool. The 9 year old was, in her words, a little impressed. ← Which iPhone should you buy?